Special tests are intended to help guide the physical examination, it is our hope that we can help your understand WHY you perform each test! If you are interested in learning more advanced content, we urge you to look at our insider access pages. These focus on bridging the gap between the classroom and the clinic. Please feel free to send us a message with any questions. Thank you! Special tests are meant to help guide your physical examination, not be the main source of your information. 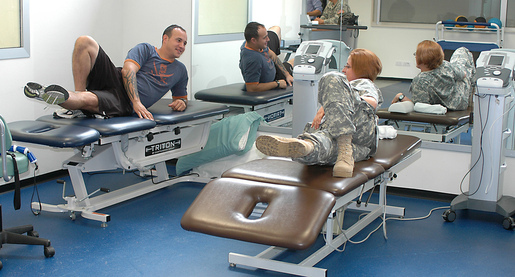 There are hundreds upon thousands of Special Tests available for physical therapists. We suggest relying primarily on your anatomy and kinesiology and then using special tests to reinforce your findings. Additionally, it is very important to read the diagnostic accuracy of each test. You will see that some of the tests we provide information on do not have the best diagnostic accuracy, and that is why it is crucial to cluster your findings with other tests, patient demographics, mechanism of injury, etc. ​On this website, we chose to include many of the tests that we personally learned in school. In addition, we added a few tests from our clinical rotations and some others that we found through research. As you make your way through school and other educational opportunities, feel free to send us descriptions of your tests and any evidence you have for them. We would love to incorporate them into this site, so we can all become better physical therapists practicing with tests that are based on high diagnostic accuracy levels. Sensitivity: Use this for ruling a pathology as less likely. A high sensitivity helps the examiner rule out a disorder. SnOut! Specificity: Use this for ruling a pathology as more likely. A high specificity helps the examiner rule in a disorder. SpIn! + Likelihood Ratio: Use this for ruling a pathology as more likely. The higher the +LR, the better the test! - Likelihood Ratio: Use this for ruling a pathology as less likely. The lower the -LR, the better the test! -Observe the patient as they are moving around in the clinic: gives you a general idea of the patient's mobility. -Subjective History: most of the information important that will guide your examination/evaluation will come from here! -Observe the patient's posture: are they slouched, favoring one side, etc. -AROM: stresses both the contractile and non-contractile tissues. -PROM/end-range feel: tests the opposite direction's tissues and limitations to the patient's end-range. -Resistance Testing: determines the strength of the patient and puts alternate stresses on the contractile and non-contractile tissues. -Neuro Assessment: test the myotomes, dermatomes, reflexes, and nerve distributions. -Palpation/Accessory Motion: spend a lot of time palpating ligaments, joints, muscle attachments, joint motion, etc. -Special Tests: let the patient's subjective history and results of the rest of your exam guide which special tests you choose from due to how many there are. Muscle: a muscle will elicit pain when contracted, stretched, or palpated. During muscle repair, mobilization of the tissue in a non-painful range can help in aligning the muscle fibers along tension lines. Ligaments, Fascia, Capsule, and Tendon: these collagenous tissues will be painful when stretched or palpated. During collagen repair, mobilization of the tissue in a non-painful range can help in aligning the collagen fibers along tension lines. The added tension can aide in stimulating fibroblasts as well. Discs: discs elicit pain with compression and shearing. While there is a period of time for immobilization, while discs are healing, patients should begin incorporating bending and twisting exercises into their rehab to build up the tension lines in the discs, so they can withstand everyday activities and the tension they produce. The motions help nutrients enter the disc and again stimulate fibroblast function to produce collagen. Articular Cartilage: this form of tissue is painful when compressed and alters the mobility of the joint. While the cartilage is repairing, it is important to include alterations between compression and decompression with gliding to stimulate chondroblasts to form more cartilage. Bone: bone elicits pain with percussion (think about the percussion and hop tests!). When bone is healing, it is important to include weight-bearing activities, so the new bone forms along the stress lines (think Wolff's Law).